balance Me Super Moisturising Hand Cream | £14.50 // Balance Me aren’t joking by calling this super moisturising as it’s one of the thickest hand creams I’ve tried. It’s almost more of a balm than a cream. It’s perfect for the winter when the eczema on my hands is acting up. I wouldn’t recommend this unless you have very dry hands though as it can feel very greasy. I also only use this at night so I’m able to do nothing and just let it soak in. That way even if my hands are feeling a little bit greasy, it doesn’t really matter. In the morning I always wake up with smooth soft skin. It's also a great one if you wear nail polish a lot or after removing gel nail polish and your cuticles are looking a bit dry. Aesop Resurrection Rinse-Free Hand Wash | £7 // I was a little bit disappointed in how dry this makes my hands feel as it’s not cheap. It smells really nice as you’d expect from Aesop but I always feel like I need to apply a hand cream straight after which I don’t feel the need to with other hand gels. I really like the bottle design and it’s a nice size for my bag but I think I’d just buy a large bottle from a different brand and decant it in the future. I'm glad I tried it but if you're thinking about buying it, skip it and try the one from Soap & Glory. 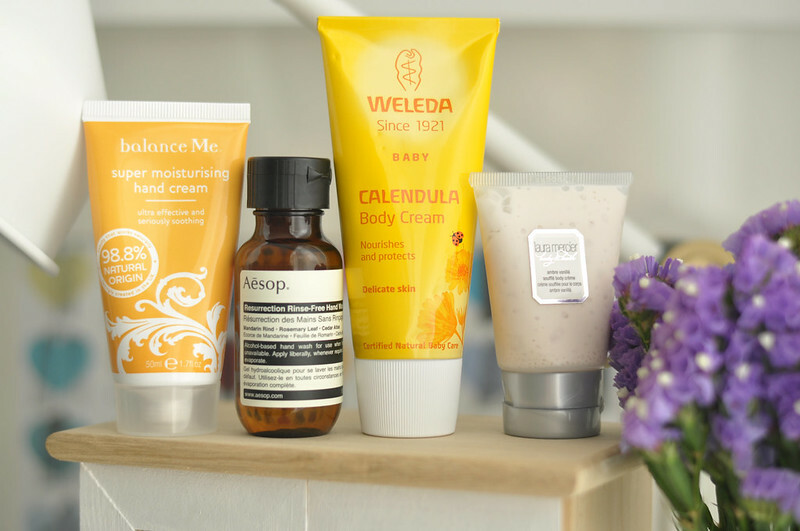 Weleda Calendula Body Cream | £7.95 // I bought this after falling in love with the face version. This is meant to be used on babies but since I have sensitive eczema prone skin I though it would be perfect for me. It's also a pretty good price for a moisturiser with great ingredients. Weleda is a brand that's starting to become better known and I'm really happy about this. It has the same subtle scent as the face cream does which I really like as it's not going to interfere with a perfume. It has quite a thick consistency that reminds me a bit of the Weleda Skin Food if you've tried that, just not quite as thick and balm like. I tend to only use this cream at night as it does leave your skin feeling slightly tacky until it sinks in. It's also one I would only use in the winter as it's a bit too heavy feeling for the summer. Calendula is an ingredient that my skin loves and I think it really helps my eczema so perhaps one to try if you have similar skin to mine. Laura Mercier Ambre Vanille Body Creme | £44.50 // I've been pretty disappointed with Laura Mercier body moisturisers and considering the price, I thought they'd be a lot better. I find they take a while to sink into the skin and not because they have a thicker consistency, in fact they feel quite light, it's that they leave a greasy feeling to the skin. I also wasn't a huge fan of this scent as I found it a bit too sickly sweet. If it had been a shower gel then I think the scent would have been ok but as the scent lingers for a while after you apply it gets to be a bit too much. Save your money and try something else from Laura Mercier such as the honey bath.